Only a systems administrator who has access to the DNS records for your domain name can complete this step for you. If you use an external DNS provider, you should forward these instructions to them. Except for the “postmaster@” step below, which should be completed by the person who manages your distribution lists and email inboxes. NOTE: Whenever you see yourdomain.com below, you should replace that with your actual domain. If you do not have an existing SPF we recommend you have an competent network administrator create an SPF record for your environment. Please keep in mind that an improperly configured SPF record can cause your email to be rejected by the receiving mail server. It is likely that many if not most of your recipients use Gmail. Google Postmaster Tools allows you to analyze your email sends to these users, offering data on delivery errors, spam reports, reputation scoring, and more. The setup process below is required to ensure that you and Sailthru can work to ensure optimal deliverability, mitigating any issues that may arise. These configuration steps require a Google account of your own, and one for each additional co-worker for whom you wish to grant access to this data. If domains are listed, and you need to add a new domain, click the plus sign in the bottom-right. If no domains are listed, click Get Started. 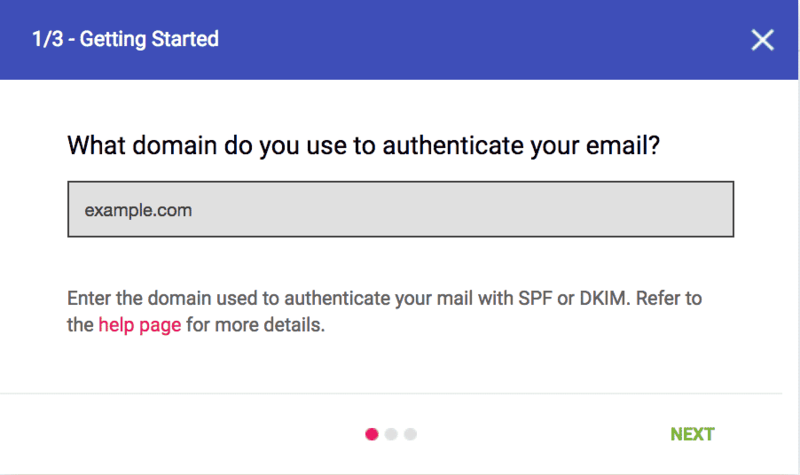 On the Getting Started dialog, under “What domain do you use to authenticate your email?”, enter the domain that your company uses for your From address when sending email. Under Domain Configuration, copy the entire TXT record displayed in the gray box and ask your domain/IT administrator add this text as a “TXT record” for your domain. Click Not Now if you are waiting to have this TXT record implemented by your IT/domain administrator. Once the TXT record is implemented, return to postmaster.google.com, hover your mouse over the domain name, and click Verify Domain. 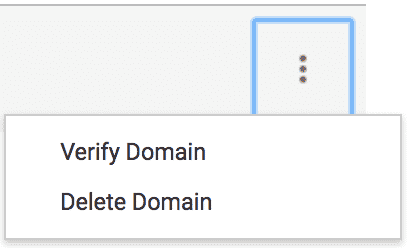 Once the domain is verified, you’ll need to add Sailthru as a user, plus any additional coworkers who will need to view Gmail deliverability information. 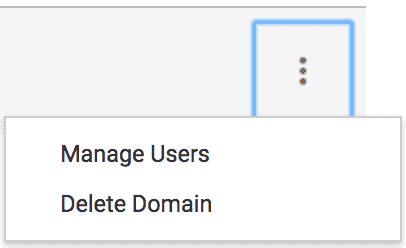 Next to the domain, from the menu, select Manage Users. Click the plus sign to add the email address of a user to authorize. The user’s email must be associated with a GMail or Google Apps account. The Sailthru address to add is gpt@sailthru.info. Enter the email address and click Next. Click Add Another or Done. Notify your Project Manager or Customer Success Manager when the Sailthru address is added. sailthru._domainkey.yourdomain.com should point to yourdomain.com.sailthrudkim.com. sailthru._domainkey.amazon.com should point to amazon.com.sailthrudkim.com. sailthru._domainkey.wikipedia.org should point to wikipedia.org.sailthrudkim.com. This step requires you to set up only a CNAME. Once this is finished, your Sailthru Account Manager will set up the DKIM key (a long string of letters, numbers, and other characters) for the DKIM record to be complete. The DKIM record proves authorization from your sending domain. Note: A subdomain, while optional, is also recommended. If ever your top-level domain gets blacklisted, it won’t affect the mailing domain. sailthru._domainkey.sports.amazon.com to point to sports.amazon.com.sailthrudkim.com. DMARC, which stands for “Domain-based Message Authentication, Reporting & Conformance”, is an email authentication protocol. It builds on the widely deployed SPF and DKIM protocols, adding a reporting function that allows senders and receivers to improve and monitor protection of the domain from fraudulent email. Add this new subdomain to the Link Domain field on your account Settings page. If your Sailthru account is used for sites on multiple root domains, create a link domain for each and in the Link Domain field, separate them with commas. For example link.brand1.com,link.brand2.com. Add this to the Horizon Domain field on your account Settings page. This is required for Horizon to collect data. The root domain must be the same for both the Link Domain and the Horizon Domain. The root domain is the mycompany.com portion of your domain. For example, you could not have a Link Domain at mycompany.net and a horizon domain at mycompany.com. Lastly, if you have multiple Sailthru accounts, do not use the same Link Domain across multiple accounts. Create a postmaster@yourdomain.com address if you don’t already have one. This must be done for every domain you send from. Once your CSM/PM submits the form for the Feedback Loops setup, you will receive an email with a verification code to confirm your postmaster@ address. Provide this code to your CSM/PM as soon as possible as the code expires quickly. This will complete the registration. If you use Google Apps, you will already have a group (i.e. distribution list) in your Google Apps interface called postmaster@yourdomain.com. You will need to add a user (i.e. an email address) to that group, so that someone (you or a co-worker) can open and click an email sent to that distribution list. Once you’ve added a user to that group, let us know, so we can send the confirmation email you’ll need to click. Visit the Settings page in my.sailthru and add your records to the relevant fields. Please click here for details on each field.